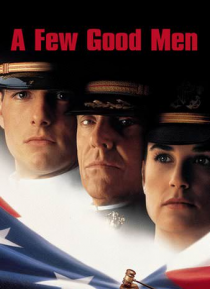 Tom Cruise, Jack Nicholson and Demi Moore star in Rob Reiner's unanimously acclaimed drama about the dangerous difference between following orders and following one's conscience. Cruise stars as a brash Navy lawyer who's teamed with a gung-ho litigator (Moore) in a politically explosive murder case. Charged with defending two Marines accused of killing a fellow soldier, they are confronted with co… mplex issues of loyalty and honor, including its most sacred code and its most formidable warrior (Nicholson). Superbly directed with a trio of powerhouse performances and an outstanding supporting cast including Kevin Pollak, Kiefer Sutherland and Kevin Bacon.